The English Trade Union Congress takes the view that, in a real Democracy the “Will of the People” is sovereign. The People and the elected House of Commons, with an overwhelming majorities, voted to trigger Article 50 of the Lisbon Treaty. Now it would appear that certain unelected Lords are putting forward amendments to frustrate the democratic “Will of the People”. This must not be allowed! These Lords are putting their own unelected views above the Brexit referendum democratic result. 3 Comments on "Abolish the House of Lords! 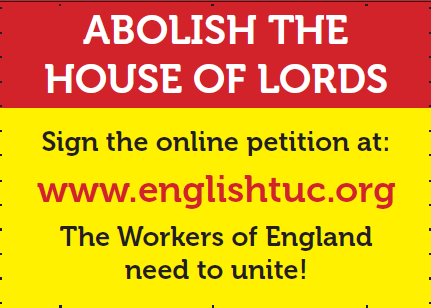 The English Trade Union Congress’ battle bus will be outside the House of Lords – 28th February"
These so called lords are wallowing in our hard earned money and to cap it all they are defying the will of the population of Britain by holding up the clean exit from European rip off bureaucrats who are also wallowing in our money. Let’s get rid!